Petya | 16. 02. 12. Ma befejezzük heti, Valentin-nap kapcsán választott témánkat, és az eddigi szíves, szerelmes leckék után ma azt tanuljuk me, hogyan kell egy esküvőről beszélni. ... és akkor jöjjön is a mai lecke! Most weddings in the UK are either a civil ceremony or a religious ceremony, held in a church. First the couple has to choose and book a reception venue, draw up a guest list, send out invitations, choose bridesmaids and the best man, buy the wedding dress, arrange a honeymoon, and of course, select the wedding rings in the meantime. If it’s a traditional white wedding, the groom and the best man arrive at the church first, followed by the guests. Last to arrive is the bride, normally dressed in a long white wedding dress, her face covered in a veil, carrying a bouquet of flowers, and accompanied by a couple of bridesmaids in matching dresses. Usually the bride's father walks her down the aisle to “give her away”. During the service the bride and groom say their wedding vows and at the end they exchange wedding rings. They are pronounced man and wife and they seal the ceremony with a kiss. When the newlyweds come out of the church, the bride sometime turns her back and throws her bouquet into the crowd of girls that gather to catch it. The one who gets the bouquet is believed to be the next one to get married. 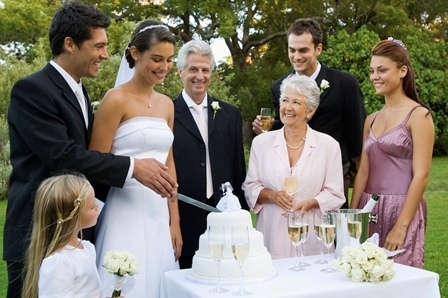 The ceremony is usually followed by a formal lunch or dinner at a hotel. At the end of the event, the happy couple traditionally leaves to go on honeymoon.